Nick Santoro, Inside Sales, will serve our global customer base by answering technical inquiries, generating quotes and providing customer support. He will also support our outside sales team across all territories. Nick’s background is in sales and customer support. He previously served as a technical sales engineer and has experience designing and building industrial automation equipment. Nick holds a BS in Materials Science and Engineering from the Rutgers College of Engineering at Rutgers University, New Brunswick. December 2018—With the holiday season upon us, General Magnaplate would like to share with you some of the ways we contribute to charitable causes, and humanitarian and educational programs in our community and worldwide. This year, we are supporting Heifer International with a donation to several of their programs. One of these is a gift of honeybees which will be given to families to earn income through the sales of honey and beeswax. Another part of our donation goes towards gifts of milk and egg producing animals along with sheep, alpacas and llamas which have valuable wool that can be sold. We also donate to Puppies Behind Bars, the American Red Cross, the Leukemia and Lymphoma Society, Kaleidoscope of Hope, Special Olympics, and the American Cancer Society. General Magnaplate has continued its membership with the Intrepid Sea, Air and Space Museum’s Anchor Society, supporting the Museum’s many education programs, exhibitions and maintenance of their extensive collection of historic artifacts. General Magnaplate set up scholarships with Endicott College and Pepperdine University, to fund programs which enable single parents to have a residential college experience with their child, and for foster children to complete their education. This year, we contributed to the Pepperdine Strong Fund, to help students and their families who were impacted by the terrible fires in California, and to help the family of a freshman student who tragically lost her life in the horrific nightclub shooting in Thousand Oaks. Here in Linden, we support our local community, contributing to emergency services, arts and education programs, donate to our town’s food bank and hire help from ARC, a county agency which helps those with disabilities find employment. In our plants, we’ve celebrated Earth Day for many years, cleaning up our work areas and parking lots, planting flowers and trees, and continue to enjoy vegetables from our company garden. We recycle plastic bags, bottles, cans and paper. We continue to look for ways to conserve energy and resources and greatly appreciate the assistance of all our employees in helping us to help others and the environment all year long. May the spirit of the holiday season fill you and inspire you! Building on the momentum of our recently expanded office and production space, we recently added a new robot to our PLASMADIZE® and thermal spray processes at our Texas facility. The new robot, an ABB IRB 6700, replaces an older model that had served us well for many years. In addition to applying PLASMADIZE® and other thermal sprays with greater precision and speed, the robot will play a key role in our patented CMPT® process—our breakthrough tool-making method that enables fabricators to reduce time and save costs on parts constructed from composite materials. A robotically applied, all-metal weaving process, CMPT® provides the accuracy, precision and surface quality of machined composite lay-up molds. It eliminates the time consumption and waste of making heavy, metal machined molds—making it a very green process as well. Along with our eight other CMPT® patented processes, a new patent is pending for a support composite with a proprietary high-temperature urethane-type casting material. Because it is a room-cured material, this casting can be made into any dimension and will be used in place of metal support mechanisms previously deemed too expensive. The first-article casting is currently at our Texas plant and is under evaluation. We’re excited to announce that we recently completed the construction of our new office space in our Texas plant. As part of this project, we also expanded our production space and modernized our equipment—enabling us to streamline our coating processes and better serve our customers. General Magnaplate Texas operates out of two facilities. We constructed 3,500 square feet of new office space at one and renovated the other, including demolishing our old sales, quality control and production offices. This opened up roughly 5,000 square feet of warehouse space, which we now use for masking, incoming/outgoing inspection and production staging. In addition, we updated our TUFRAM® line with new, state-of-the art tanks and processing technology, enabling us to run more parts with greater speed and efficiency. “General Magnaplate has grown substantially in the last five years,” says Vice President/General Manager John Larsen. “By creating a more open work area and eliminating a lot of wasted space, we’re now able to streamline a lot of our operations. This will allow us to better track customer orders, improve our quality and delivery processes and increase staff as business continues to grow. Tripp Melcher joins our inside sales team at General Magnaplate Texas, providing our customers with technical advice and quotes from the Arlington plant. In the future, he will move to outside sales, where he will be responsible for providing advice on our smart coating solutions to our customers in Northern Texas, Oklahoma and Arkansas. Previously, Tripp was in the real estate industry. He graduated from the University of Mississippi with a BA in Marketing in 2016. As our new Management Trainee, Nick Malinousky will be learning as much as he can about General Magnaplate’s coatings and business practices and will join our management team once he finishes rotating through our departments. Previously, Nick was the office manager for a construction company. He also interned as a Business Solutions Consultant for a New Jersey-based health and nutrition company. An Eagle Scout, Nick holds a BA in Computer Information Systems and MBA from Quinnipiac University. We’re proud to announce that Brett Ellerbrock, Technical Sales, has recently received his Certified Electroplater-Finisher (CEF) certification. He joins 1,700 other surface technology professionals who have, to date, received this esteemed designation from the National Association for Surface Finishing (NASF). The goal of the CEF program is to expand engineers’ knowledge of electroplating and other surface finishing processes. The five-day course, which ran in Cleveland, Ohio, from June 4th to 8th, included 40 hours of seminars on a range of topics, including chemistry, electricity, electrochemistry, metallic corrosion, part fabrication, preparation and testing, as well as various plating processes for metals. At the conclusion of the course, Brett successfully passed its rigorous 2.5-hour exam. Brett first came to General Magnaplate as a management trainee in 2012. His recent CEF certification complements his other degrees in materials engineering: Brett holds a BS in Ceramic and Materials Engineering from Rutgers University (2006), as well as an MA in Materials Science and Engineering from Clemson (2010). Ryan Spuler joins our Technical Sales team at General Magnaplate Texas, where he will handle outside sales in his territories of southeast Texas and Louisiana. Ryan comes to us from the maritime industry. Previously, he was the Sales Manager for Wrist Ship Supply in New Orleans. He also lived and worked in Singapore for 14 months. Ryan holds a BBA in Finance from Texas Tech University. Marino Rosario has been promoted to Plant Manager at General Magnaplate New Jersey in Linden. For over nine years, Rosario worked in production on the NEDOX® and PLASMADIZE® lines. Now, he will be responsible for keeping all of our production processes moving smoothly—whether assisting employees with masking, answering questions, reading blueprints or assisting in production. May 9, 2018 - Linden, NJ - General Magnaplate Corporation is proud to announce that an exclusive license agreement has been signed with the UK’s Poeton Industries Ltd for the Apticote A20X™ surface enhancement process, used for treating the innovative A20X™ aluminum alloy. 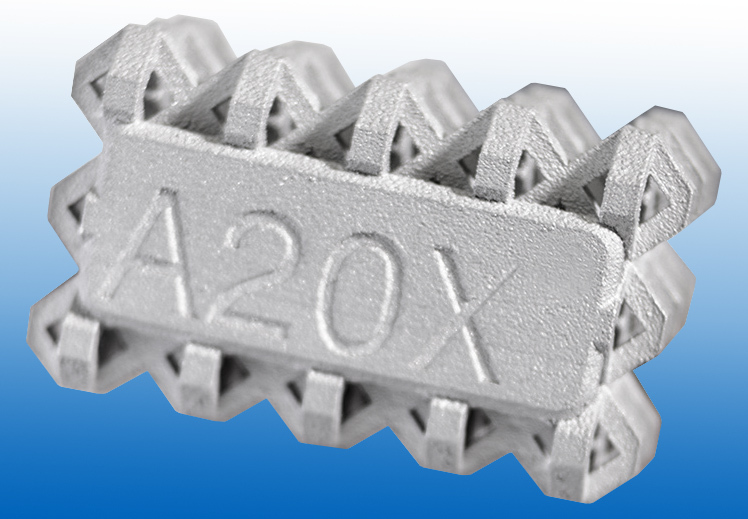 A20X™ has a unique solidification mechanism and highly refined microstructure giving it exceptional strength, fatigue and thermal performance characteristics in both cast and additively manufactured form. Developed and patented by Aeromet International Ltd, a leading UK-based aerospace casting supplier, A20X™ is now licensed to foundries around the world, including across North America, and is also available in powder form for additive manufacturing. The agreement means that General Magnaplate will become the exclusive supplier of Apticote A20X™, which they will brand AptiMag-X™ in North America. Licensed A20X™ foundries, additive manufacturing companies and aerospace customers will be able to have parts treated with AptiMag-X™ at the company’s facilities in Linden, New Jersey and Arlington, Texas. A20X™ is MMPDS certified (as AA205) and is the strongest cast aluminum alloy available today, with strength properties comparable to 7000 series wrought material. A20X™ cast and additively manufactured parts are in production today for major aerospace customers. The AptiMag-X™ treatment enhances the surface of A20X™ parts improving wear resistance, hardening and finish. Adam Smith, Group Commercial Manager for Aeromet and A20X™ commented: “Aeromet are pleased to welcome General Magnaplate to the global A20X™ supply chain. By bringing AptiMag-X™ to North America, General Magnaplate will be well placed to support the growing number of aerospace and defense customers taking advantage of A20X™ advanced aluminum castings and additively manufactured parts”. We welcome Robert McKenzie to our global headquarters in Linden, New Jersey. As our new Quality Manager, he will be responsible for the health and validity of our Nadcap- and ISO-regulated quality management systems. Robert has previous experience working in project planning and management, engineering, quality assurance, quality control and manufacturing process improvement in the commercial, industrial, military, automotive, medical and aerospace industries. He managed the quality systems for a medical device component manufacturing facility, as well as the quality control department of an automotive injection molding and progressive die stamping facility. Robert holds a BS in Business Administration with a concentration in Business Management. Ligon de Vogel joins our team as Project Manager at General Magnaplate Texas. In this role, he will be overseeing work related to plant construction. He will also support production and sales and assist on special projects. Ligon has experience in the oil and gas industry and previously worked for the North Dakota-based oilfield service company, B&G Oilfield Services, as a Directional Drilling Foreman. He holds a BA in Natural Resources and the Environment from Sewanee: The University of The South. As our new Technical Sales Representative at General Magnaplate Texas, Brian Flammer will be educating our customers in Southern California and Arizona on the benefits of our coatings. This includes discussing possible applications and providing technical advice. Brian’s educational background is in physics and business management. Previously, he sold securities for a broker-dealer firm. We recently promoted Matt Zaragoza from Inside Technical Sales/Plater to Production Manager at General Magnaplate Texas. In this new role, Matt will ensure our production processes run smoothly and efficiently. He will also continue to handle technical sales, including providing customers with quotes and answering technical questions related to our coating processes. January 22, 2019—General Magnaplate is proud to announce that both the Linden, New Jersey and Arlington, Texas facilities have gained accreditation to the newly revised ISO 9001:2015 specification, which adds additional risk management requirements to our Quality Management Systems. We are audited annually, and our certificate is valid until 2021. This ISO standard and General Magnaplate share the same principles of commitment to quality and excellence, along with constantly striving for improvement. General Magnaplate’s customers have benefited from our dedication to those principles for over 65 years, and this accreditation reconfirms that commitment. In addition to ISO, General Magnaplate is Nadcap Accredited, and is an OSHA VPP Star Site –– the highest award from OSHA for exemplary safety and health. We have participated in the VPP program for over 22 years, and are one of only four small businesses in New Jersey to be honored with Star status.